So in full disclosure, I did not purchase this book, my friends. A couple years ago, some friends and I attended The Influence Conference, and it was in my swag bag! It's been sitting on the shelf for some time since then, and I finally got around to reading it a couple months ago. I needed a quick read and wanted something different and new, and this delivered. 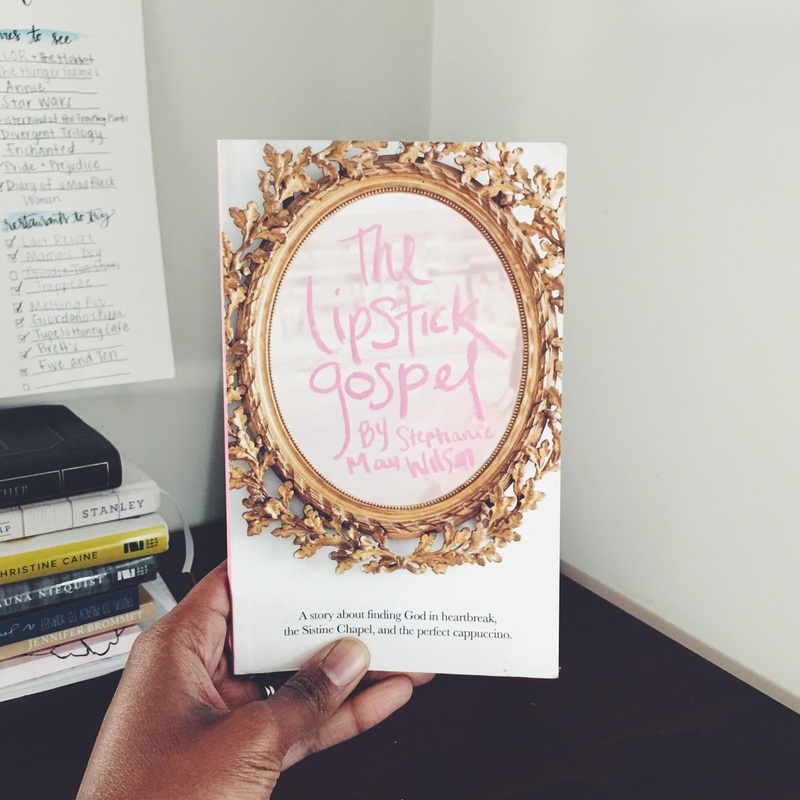 The Lipstick Gospel: A story about finding God in heartbreak, the Sistine Chapel, and the perfect cappuccino is a beautiful story of how Stephanie May Wilson was found by God and wooed by Him in the most unlikely of circumstances. She writes with candor about how her life was in shambles, but she was trying to hold it all together. When it all fell apart, she was embraced and loved on by friends who knew Jesus and just wanted her to know Him, too. Stephanie shares all about her college experience and how God used that time to lead her closer to Him and to make Himself real in her life. In all honesty, her college experience was completely different than mine. She was a sorority girl and had romantic involvements, and she studied abroad and had all kinds of adventures. But even though our experiences were different, I could still see myself in her story- she endured heartbreak and uncertainty, just as any twenty-something does. Every misconception I had about God and Christianity had been blown out of the water. God was thrilling and dangerous and safe all at the same time. He was wild. He would send you to the corners of the world if you said you were willing and would heal your wounds with soothing tenderness. He was everything good about life wrapped up into one. He was French wine and Spanish olives and Italian cappuccinos. He was quiet times in Costa Rica and being baptized in the mountains and best friends and the creakiest bunk beds. He was fireworks and adventure and love that seeped into every corner, spreading farther than the eye can see. And I wanted more of Him. This book drew me in because Stephanie didn't hold back. She didn't write of past mistakes with shame and regret, but rather with gut-level honesty and gratitude for how God had changed and shaped her as His beloved daughter. I highly recommend it for anyone, whether your story is similar or different. Reading other's stories is a way for us to find connection amongst those who are not like us by understanding the greatest connection we have, which is the body of Christ.